After two crazy weeks of too much travel and too many hours worked, it appears that I won't be doing any overnight travel for a few weeks. To celebrate, I immediately called the Humane Society and asked for a foster. It's a really busy time for injured dogs right now. Despite my request for a small dog, I still had 5-6 dogs to choose from. The foster coordinator started telling me about them all but I stopped her and told her I'd take whatever. She decided on the 2-year-old poodle with a broken pelvis. Meet Harriet. I have about 50 pictures exactly like this. She is very interested in sniffing the camera. On top of that, since she is relegated to cage-rest only, when she's not in a crate I'm either carrying her or I have her on a 4' leash to take her out to potty. All of this makes it difficult to take her picture. Harriet came in as an injured stray. They don't know how she broke her pelvis. Usually a broken pelvis means hit by car, but I am guessing this is not the case since she has no lacerations or other owies, so that is good. Other than the limp, which is already almost gone, she seems perfect. Harriet has had limited interaction with the other doggies. Since she is not allowed to run or play, I usually take her outside by herself. If she does get to go out when the other dogs are around, she has to stay on the short leash. In the limited interaction she has had with my dogs, she has fallen in love with Mo. Weird. This is the first dog ever who has chosen Mo as their favorite. This might be the first dog ever who even wants to be friends with Mo. We all spent quite a bit of time sitting outside on Saturday because the weather was so lovely. Mo likes to sit right by me, which worked out perfectly because short-leashed Harriet really likes to sit right by Mo. Yeah, I know....another horrible picture. 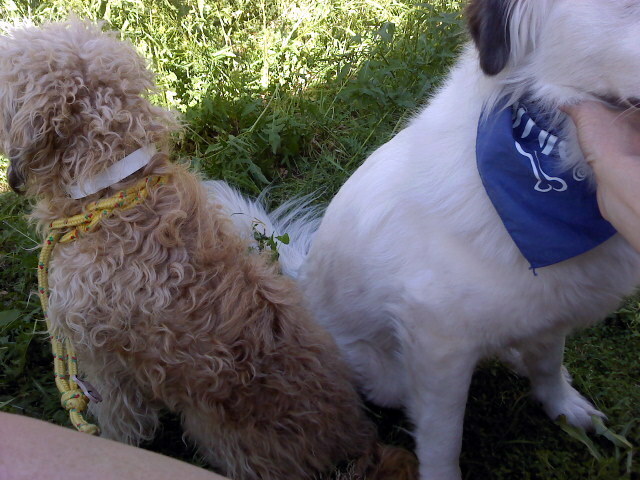 But seriously, it is hard to get a picture of dogs who need to be so close to me. Here we go, a semi-decent picture of the poodle: Isn't she cute?! I named her Harriet because she's so hairy. And because I've been wanting to name a dog Harriet for about 3 years now and finally I've got one that fits the name! Yay! I've cut about 50 mats off her and I 've given her a bath so she's looking even cuter and fluffier now. She is such a sweetie, she tolerates all the brushing and washing and poking around with the scissors. I made the mistake of taking her off the leash during one of our potty breaks...mostly because I was trying to get a good picture of her and for this I needed a little bit of distance. As soon as I got the little bit of distance...WHEE! Harriet was off and running! PLAY! RUN! YAY! Oops. Lesson learned. Back on with the leash, back on with the torture of a poor playful little poodle. She goes back to the Humane Society on Wednesday for another x-ray. Hopefully they will tell me that she is healing nicely and can be upgraded to limited activity. She would so love to go for a walk!